Matt joined the RAAF from school and gained 14 years experience flying Hercules transport aircraft, Boeing 707 VIP tankers and instructing on the Pilatus PC-9 as flown by the Roulettes. Now an airline captain for over 12 years and currently flying for China Southern on the Airbus 330, Matt will use his 18 000 hours flight experience to make sure you have a safe and enjoyable flight with Combat Flights Melbourne. Growing up on a farm in Tasmania, Anatole soon decided flying was more fun than chasing cattle and traded in the Blundstones to begin a flying career. With over 3,000 aerobatic sorties under his belt, Anatole has seen Melbourne as much upside down as right way up. He also flies biplanes and charter for Adventure Flight Co and surfers with King Island Surf Safaris. 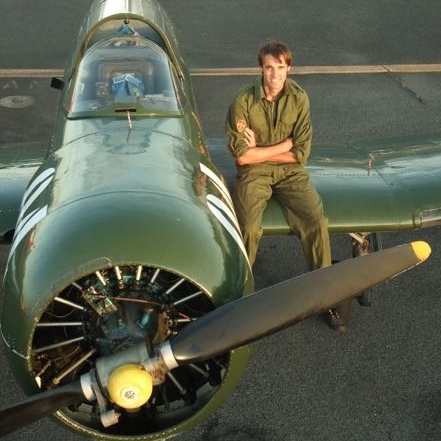 A third generation pilot, grandfather Ernest Mills learned to fly in an autogyro in the 1930s and it was in his father's bush planes that Anatole got the flying bug.